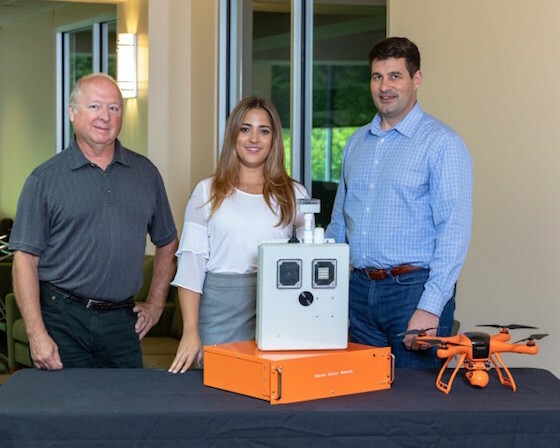 Inventors of the integrated sensor technology include Peter Fuhr, left, Marissa Morales-Rodríguez and Sterling Rooke. A multi-parameter sensor technology using various sensors that measure physical and environmental parameters and respond to standard security applications is now in the hands of Brixon, Inc. after the company licensed the technology from the Department of Energy’s (DoE) Oak Ridge National Laboratory (ORNL). By incorporating multiple sensors onto one common platform, the technology forms a network of devices able to connect and exchange data. New or existing sensors communicate to a main controller forming a sensor cluster. The sensors measure parameters like temperature, irradiance, chemicals and electric grid elements and can provide physical and cybersecurity awareness through monitors mounted or used with drones for surveillance. The novel functionality of the platform has a potential for lower cost, better performing and faster operating sensors than its competitors. The technology features a modular design compatible with conventional commercialized and customized sensors. “Their access and interactions with a wide variety of organizations involved in this entire cybersecurity realm expands the reach of ORNL’s developed technology, making this the proverbial win-win situation,” he said. Brixon, based in Baltimore, Maryland, addresses the security and reliability of industrial cyberspace through data analytics and sensor technology by uniting physical sensors and artificial intelligence, with the goal of minimizing the need for human intervention. This emphasis on cyber operations and response potentially reduces costs, misconfigurations and operational risks. Brixon foresees the integrated platform implemented in the industrial and electric sectors as a means of sensing and measuring remote sites. Applications include inspection of oil rigs, oversight of public water supply safety and monitoring electric utilities, among others. Marissa Morales-Rodríguez of ORNL’s Electrical and Electronics Systems Research Division co-invented the Internet of Things Multiparameter Sensor Agent Outstation technology with Fuhr and Rooke. The research team worked with the Grid Modernization Laboratory Consortium, a strategic partnership between DoE and the national laboratories.